My DofE volunteering at the soup kitchen helped me develop my communication skills as I learnt to interact with a range of people from all walks of life, from our regular homeless clients to the management team. Through working directly with adults I have also grown in maturity. I would be able to apply this experience to the customer service role, for which good communication skills with all types of customers is essential. To complete our DofE expedition our team of six had to work together, not just during the testing three days and two nights out in the countryside but also to plan our route before and to create our presentation after. We learnt to listen to others’ views and keep each other’s spirits up when needed. I believe that these skills will enable me to adapt quickly and successfully within a workplace team. For my DofE Physical section I wanted to improve my running ability; this involved running on my own and as part of a club, week in, week out, whatever the weather. There were times when I wanted to skip a session but I’m glad I kept up my motivation; as well as being fitter than I’ve ever been, I also got to represent my school in regional running competitions. My DofE experience fuelled my initiative and drive which I believe puts me in a great place to take on the Account Executive role, for which self-motivation is a key requirement. The fact that I have continued running since achieving my Award demonstrates my continued commitment and passion to tasks and challenges I set myself and others set me. 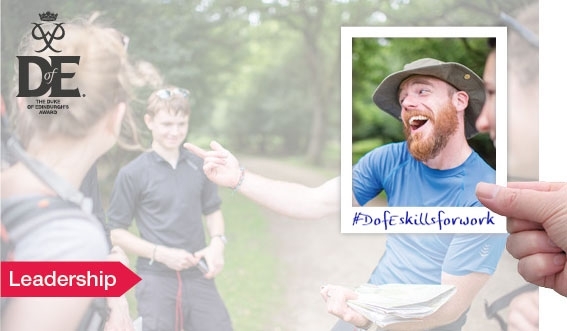 It took me over four years to achieve all three DofE levels whilst juggling my academic studies. It taught me that if I commit to something then I should see it through – and the benefits will be far reaching. My DofE Awards demonstrate that if I was the successful candidate for the Junior Accountant role I would be 100% committed to the job and each individual task that was given to me. It rained throughout my three day DofE expedition, making it difficult to set up camp and fully testing our waterproofs. We had to be resilient or we wouldn’t have got through. We took our minds off the rain by singing songs and focusing on the end goal. This experience has helped me deal with knockbacks in all elements of life and I believe it will enable me to be resilient and keep focused when managing the inevitable demands and challenges placed on the Events Co-ordinator role. I developed my leadership skills during my DofE residential as I helped out at a children’s activity camp. I supported and stood in for the Outside Instructor at various points in the week which involved giving the children direction and ensuring that they carried out the activities correctly. Taking the lead in the workplace will now not faze me and I’m happy to put myself forward when required. My DofE has helped me see how hard work can pay off, not just for yourself but for others too. I was always keen to go to my charity shop volunteering because I saw its impact; whilst I developed a range of skills I also supported the charity in raising money for its vital cause, so much so that I have continued to volunteer after achieving my Award. I believe that this positivity is essential to a successful office environment and this is something I can offer due to my DofE experience.